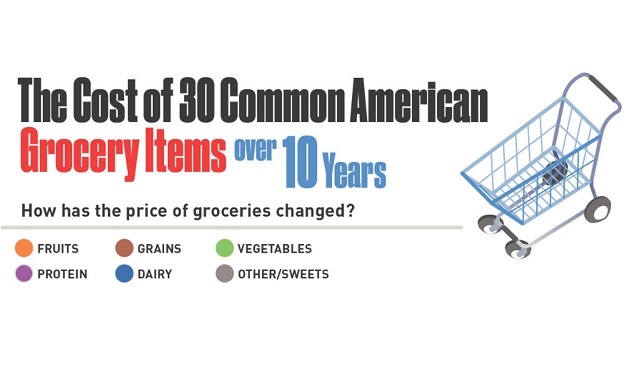 The Cost of 30 Common Grocery Items Over a 10 Year Period #infographic ~ Visualistan '+g+"
The question of whether food prices are rising, falling, or staying the same over the years is something almost every American thinks about at one point or another. We plan our grocery bills based around the average cost of our favorite items. That’s why it’s important to know what the average cost is for things like flour, beef, poultry and pasta. If you know what others are paying for certain items, then you’ll be able to gauge whether your local supermarket is overcharging you, and you can shop elsewhere for the best price. As prices for certain items rise, it may also point to global trends that you may want to be aware of. Overall, you can take more control over your grocery bill by avoiding the items that cost the most, looking for less expensive alternatives, and focusing on items that have maintained a relatively stable price over the years.